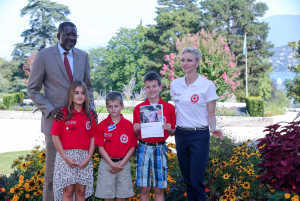 In Geneva on World First Aid Day, the International Federation of Red Cross and Red Creasant Societies (IFRC) and H.S.H Princess Charlene of Monaco called for children everywhere to be trained in first aid. In fact, children make up a large portion of the population that receives first aid in every day emergencies and large-scale disasters, and they are often bystanders when peers and family members are injured. An estimated one million children die every year from treatable injuries, and millions more are hospitalized as a result of accidents like drowning, automobile crashes, falls and burns. “Children are capable of saving the lives of themselves and others around them if they are equipped with first aid training," said HSH Princess Charlene of Monaco, a former Olympic swimmer from South Africa and President of the Princess Charlene of Monaco foundation which aims to save lives by putting an end to drowning. The IFRC is also calling on authorities to ensure that parents and other adults who are in regular and close contact with children are trained in first aid. The IFRC is the largest first aid educator and provider in the world, and for more than 150 years first aid has been one of the principal services of Red Cross and Red Crescent volunteers.